Deciduous, 11/2 to 21/2 ft. (45 to 75 cm). Zones 3 to 8. Ready-to-roll bulblets on Cystopteris bulbifera. Cyrtomium falcatum x C. caryotideum reflects the influence of both parents. Slender fronds of Cystopteris bulbifera in the garden of the late Don Armstrong. 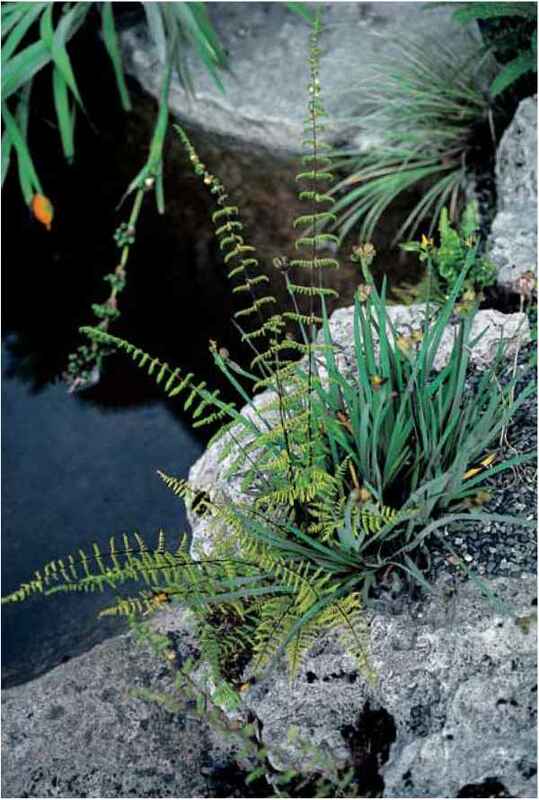 Cystopteris fragilis blades, with an elegant counterpoint of lime foliage, are elongate, often downward draping, triangular spears of 18 to 25 pairs of pinnae. The foliage is soft and has a rachis bearing a solid undercoat of three or more ready-to-reproduce minute bulblets reminiscent in shape to the Pacmen of early video games. 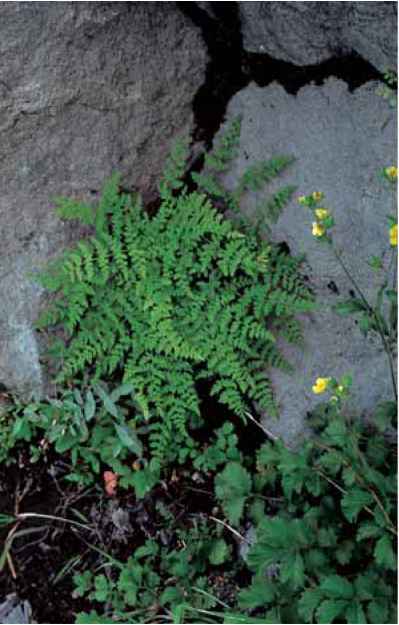 Unlike most fern bulbils these fall readily from the parent, spreading cascading colonies of plantlets. As they are easily plucked they are not an invasive threat. Sori are in cone-shaped bladders, but with the easy reproductive ability of the bulbils, verge on superfluous. range and habitat: This species of midwestern and eastern North America ranges from Wisconsin, Texas, and Utah to all areas east including comparable sites in Canada. In nature, it is primarily located on limestone. Look (up) for it on ledges where bulbil-encouraged rivulets flow down in moisture-rich limestone crevices. 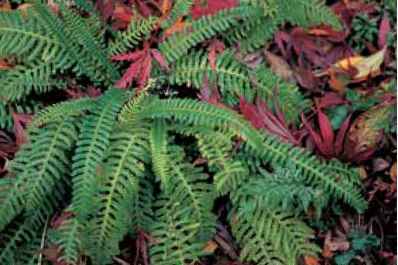 culture and comments: One of, if not the most handsome of, the cystopteris, this fern needs shade. A limestone substrate or supplement encourages good foliar health with an attendant natural beauty but is not necessary for survival. Do plant it in a consistently moist site especially on stonewalls (broken concrete is excellent), where it will produce a continuous fountain of handsome foliage and willingly populate surrounding garden sites with its bulblet cast offs. There is a crested as well as a "crispa" variety.